We accept walk in applications. You can come into our office located at 1107-53rd Avenue NE in between the hours of 8am-2pm Monday-Friday with an updated resume to apply. If you would prefer to apply on-line click the "Create Applicant Account" button on the top right to apply. Use legal firstname.lastname when creating applicant account. Please visit the Job Postings section and take a look at our current competitions. 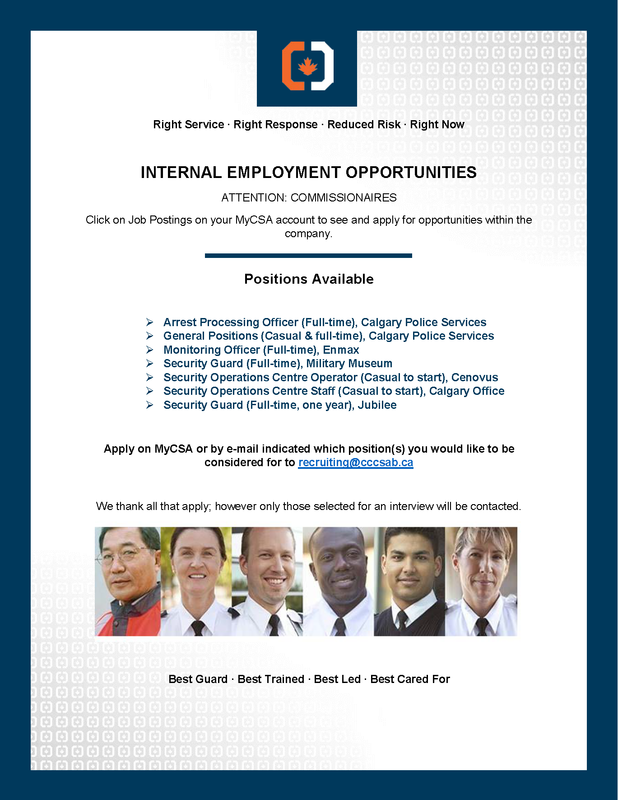 You can apply for these positions directly through your MyCSA account. Please ensure that you have uploaded an up to date resume and cover letter in order to be considered for a position. Do NOT create a New Applicant Account if you are a present employee. We ask that you visit your Competencies page and view your current SKILLS. It is very important to ensure your skills remain current and that you renew any licenses or qualifications prior to their expiry. A link to Veterans Affairs Canada's website can be found under the Veterans tab. There have recently been a number of new initiatives and enhancements on a number of programs that can be found on their website.